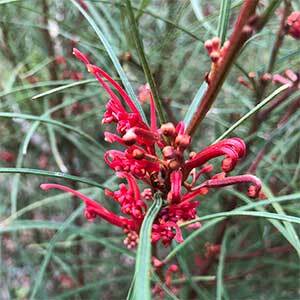 A small growing evergreen species with bright red flowers, Grevillea dimorpha will bloom from winter through to summer. The foliage is fine and linear, a good mid to deep green. Being naturally smaller growing it is suited for use as a low informal hedge and is a great choice for smaller gardens and courtyards. Naturally growing in open forest areas of the Grampians, it is often found in areas with some moisture. With both nectar filled flowers and a dense growth habit that provides protection, this is a great plant for attracting small birds as well as bees to the garden. With its natural small growth habit, this is one Grevillea that will fit into most gardens and can be grown in a container. 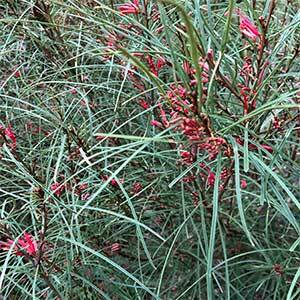 If planted in a humus rich well drained soil, and a sunny position, Grevillea dimorpha will require little extra care. A light application of mulch each spring will help maintain a cool root run through summer. It can be pruned back lightly after flowering to help maintain a more compact shape if needed. A little native plant fertiliser once a year will be beneficial especially in poorer soils. Common Name – Flame Grevillea. Height – To around 1 metre, sometimes up to 3m depending on conditions. Other small Grevillea varieties include, G. lavandulacea and G. lanigera.